I am sure most of us have heard of Hai Di Lao 海底捞火锅, the popular steamboat chain from China which has opened a few outlets in Singapore. 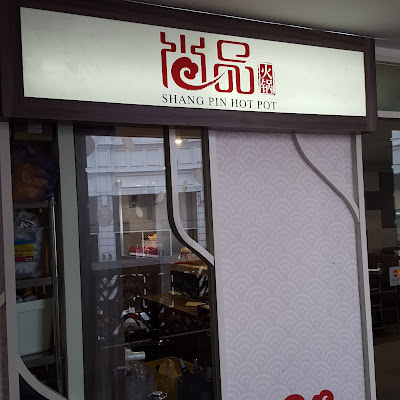 But have you heard of Shang Pin Hot Pot 尚品火锅? 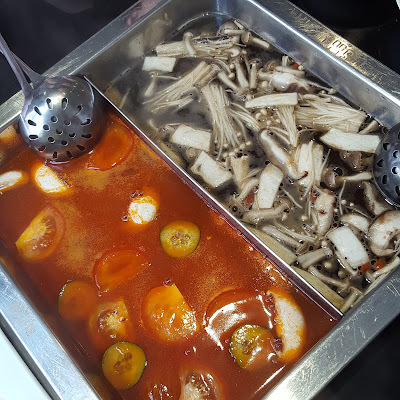 I have heard from several groups of friends that the food at Shang Pin Hot Pot is as good as Hai Di Lao and its price is cheaper. The steamboat restaurant is located at level two of Rendezvous Gallery next to Rendezvous Hotel. Given its location, I would have never known that there's such a place if not for word of mouth. 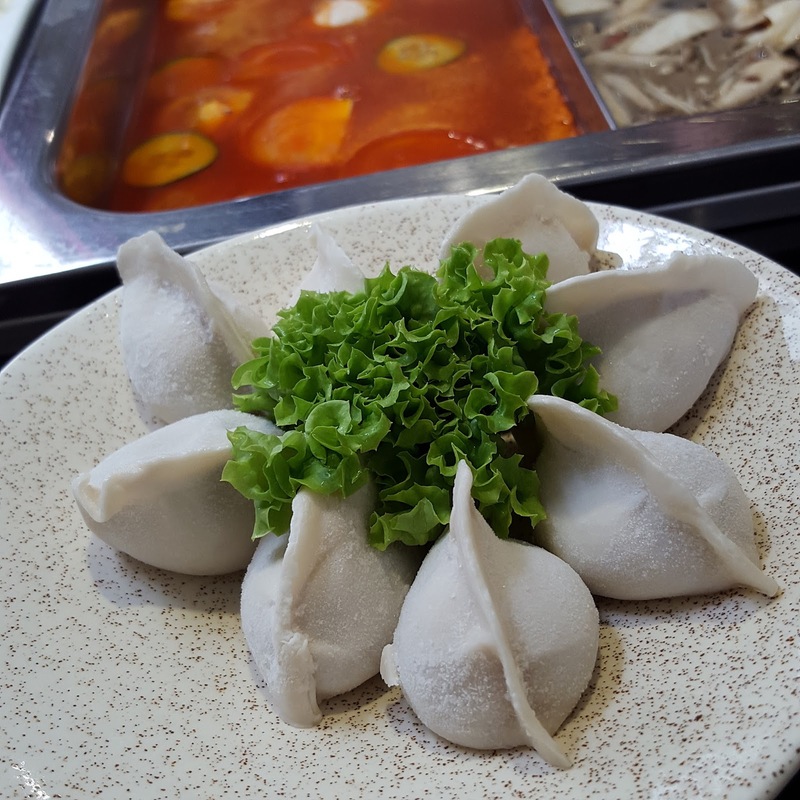 This restaurant is located 5 minutes walk away from Dhoby Ghuat MRT station. If you are lazy to walk, you can take the Circle Line and alight at Bras Basah MRT station. The restaurant is located just 1 minute walk away from this station. There is a wide selection of sauces and fruits available for $3 per person. 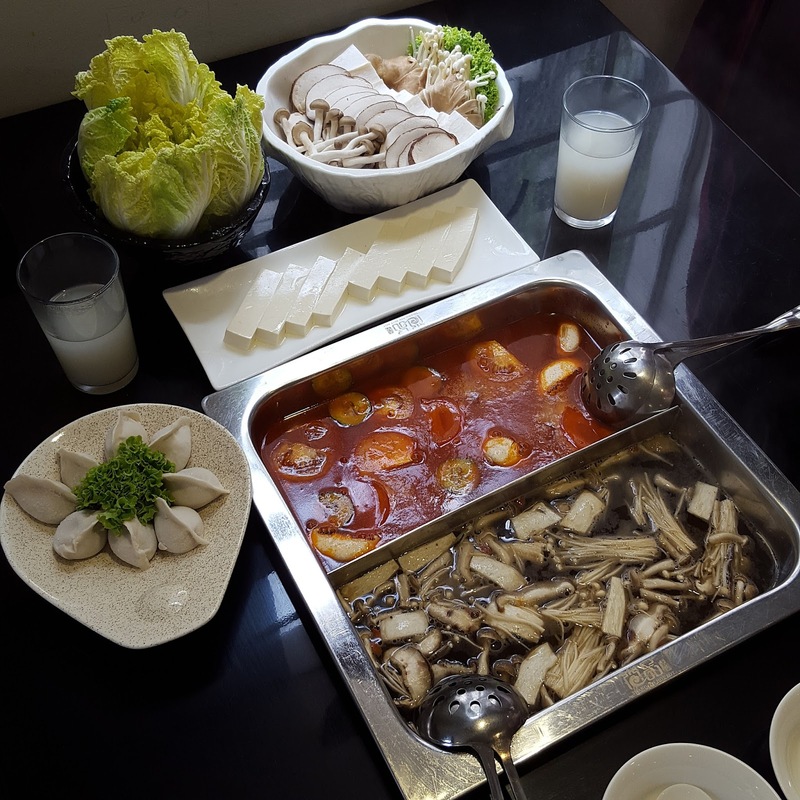 The sauces range from sesame, soya, peanut, leek flower, chilli, fermented bean paste, beef, mushroom to seafood. There are also sugar, salt, peanuts etc. Such a wide variety! We chose the multi-flavour soup base consisting of of Mushroom Soup and Tomato Soup for $12. Personally, I like the Tomato Soup as it was well balanced in terms of sweetness and sourness. However, the tangy taste overwhelmed the sweetness towards the end of the meal. 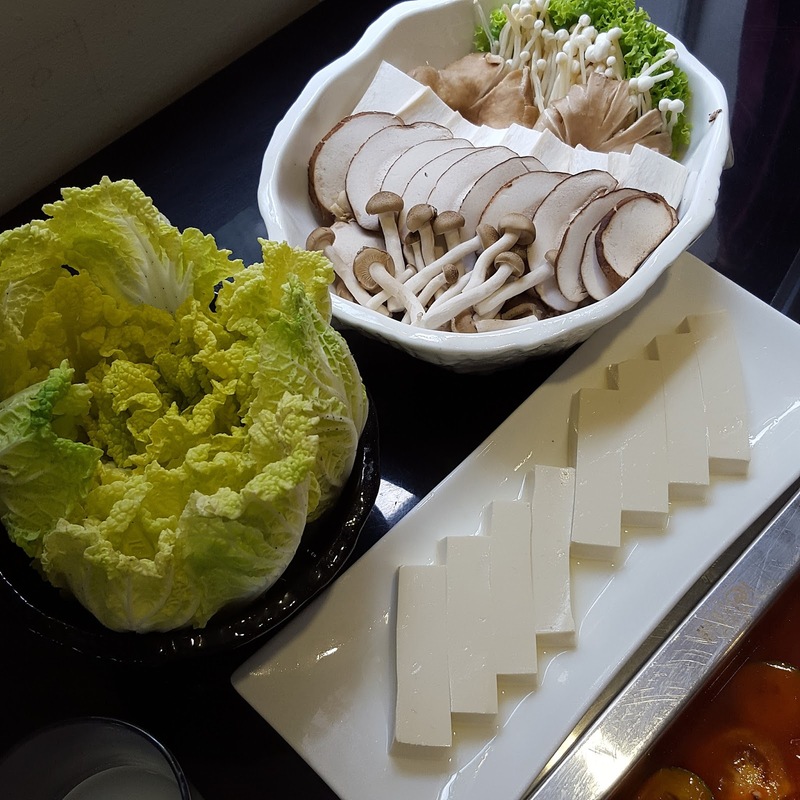 As for the Mushroom Soup, we found it on the salty side at the start. Towards the end of the meal, the it tasted more pleasant, complementing the Tomato Soup. We also ordered the free flow drinks at $2 per person. The homemade barley was real thick and good. Totally justify the price tag. We ordered the Pork Slices and Shang Pin Beef for $8 and $14 respectively. 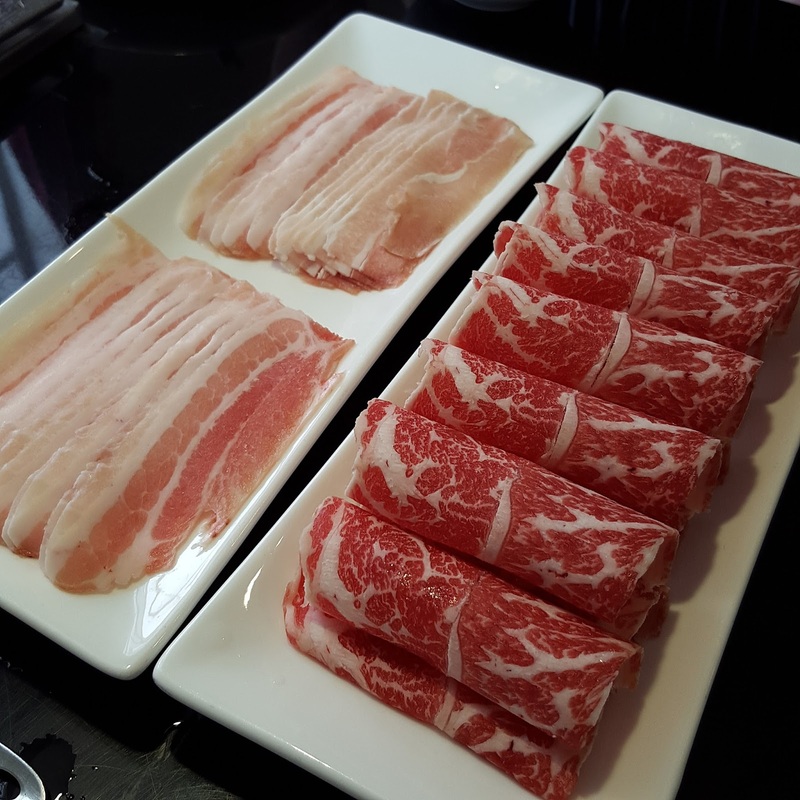 The quality of meat was good and they were sliced thinly making them easy to cook via shabu shabu style. Although the Dumplings $5 consisted of just chives and meat, it was surprisingly delicious! These were the other dishes (i.e. Baby Cabbage $4, Fresh Tofu $4, Mushroom Platter $14) we ordered. We also ordered the Shang Pin Kongfu Noodle $3 which we waited a very long time for ... more than half an hour. It was essentially a flatter version of ban mian and more expensive considering the portion. The two of us had just 4-5 short strands of noodles each. If you come in a big group, be prepared to eat just 1 to 2 strands. I would advise that you cook the noodles for a long period of time for it to become soft. The texture of the noodles was surprisingly smooth and slippery. In terms of taste, it was like the good old days when qui lian ban mian noodles taste awesome! For the record, I have visited Shang Pin Hot Pot twice. The first was during dinner on a Friday. The restaurant was fully booked. Thankfully, we made reservations. The second visit was during lunch on a weekday. During lunch time, the restaurant was not full. But in terms of service, it was way better at night when they had full staff strength. The post content and photos are all based on the second visit.